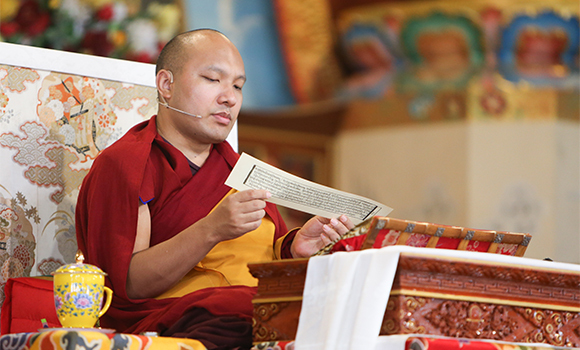 After welcoming everyone for the second day of the 4th Arya Kshema, the Karmapa continued with the discussion of the ceremony of the bodhisattva vows from Gampopa’s Ornament of Precious Liberation. Having completed the discussion of the tradition of the profound view, that of Manjushri to Nagarjuna, he elaborated upon the tradition of vast conduct, the tradition passed down from Maitreya to Asanga and known as Master Serlingpa’s tradition. The Karmapa delineated the two parts of this tradition: aspiration of the bodhicitta vow and engagement of the bodhicitta vow. 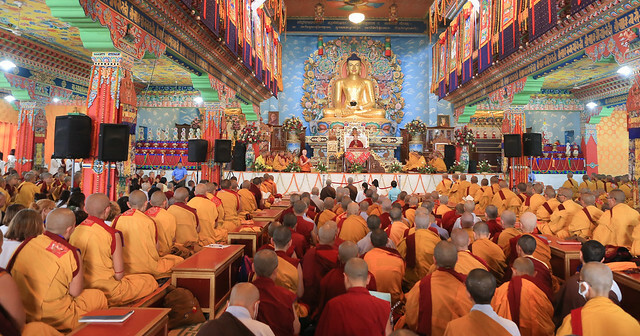 He focused on the actual ceremony of the aspiration of bodhicitta and explained that before the aspirant takes the vow, he or she must contemplate whether they are ready to receive the vow. The Karmapa explained that the bodhisattva is like a hero, though these days we see movie stars as being heroes. A bodhisattva is similar to a hero because a bodhisattva is someone who has tremendous courage. The Karmapa emphasized that when we talk about rousing the attitude of bodhicitta, it is not only for ourselves nor is it merely for those close to us. Rather, we need to be able to hold all sentient beings in our hearts with compassion. The Karmapa also explained that even though from birth we naturally have compassion, we are not always able to put it into practice. He gave the following example: one of the characteristics of a human is that they know how to speak and how to communicate. However, if small children are isolated in a place where no one talks with them, they will lose the ability to speak. Similarly, if we do not use or practice compassion, it will decrease. The Karmapa added that even the frequent use of the words “loving kindness” and “compassion” are important. He said that if we live where people use these words, it creates an imprint within us, and these qualities will grow stronger. He also reflected on the experiences we have as children and the impressions they create. For instance, when parents tell children that they need to have compassion for all sentient beings, and teach them to care for even the smallest creatures, children will not feel the need to harm other sentient beings. However, if children grow up in an environment where harming sentient beings is condoned, they will not understand that like themselves, all beings have experiences of pain and suffering. Then, they begin to think that it is acceptable to harm others. 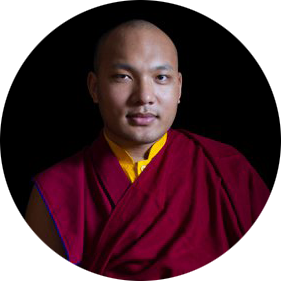 The Karmapa concluded his discussion on aspirational bodhicitta and noted that in order for the aspirant to have a conceptual understanding, he or she is taught the three types of bodhisattva discipline, which include the discipline of refraining from not acting, the action of gathering virtuous qualities, and the discipline of benefiting sentient beings. The Karmapa elaborated on the vow of engaged bodhicitta and concluded the teaching in the tradition of Master Serlingpa. “So primarily, if we are able to keep this promise clearly in our minds,” the Karmapa concluded, “then I don’t think there is any difficulty to keeping all the precepts. But if the promise is not stable and if we are not able to keep it lucid and crystal clear in our mind, then it will seem like all the precepts are bothersome and difficult, and we will think that it is too hard to keep all the precepts. I think this is a sign that we do not have a clear understanding in our minds of what a bodhisattva needs to do.” With this caution, the Karmapa drew to a close the first part of the morning’s teachings on the Ornament of Precious Liberation.